AUGUSTA, Maine — As an 18-year-old cadet at the U.S. Military Academy, Steve Rowe quickly realized that the education he received at his small high school in rural Oklahoma — while solid on the fundamentals — wasn’t going to be enough for West Point. So he attended weekend classes and tutorials whenever time allowed, to learn the higher-level math and science expected of West Point cadets. He said he worked “doubly hard” and by his senior year was on the dean’s list. Rowe insists the lessons he learned at West Point about leadership, teamwork, planning and execution have carried him through his career as an Army officer, a financial manager, a state lawmaker and, most recently, as Maine’s attorney general. Now, the Portland resident and former speaker of the House is hoping to become Maine’s next chief executive. When Maine Democrats go the polls on June 8, they will choose from four candidates — Rowe, Pat McGowan, Libby Mitchell and Rosa Scarcelli — echoing similar campaign themes: stronger schools, lower energy and health care costs, a healthy environment and a more diverse economy with enough job prospects to keep young people in the state. Rowe emphasizes the need for stronger early education programs and parental assistance to make sure students start their school years on sound footing. He also calls for more innovation in the K-12 system, including allowing schools to experiment with shorter summer breaks or daily start and finish times that better reflect each age group’s internal clocks. He pledges that, as governor, he will renew his focus during his term as attorney general on reducing domestic violence, elder abuse and substance abuse that are too prevalent in Maine. Rowe also talks about the importance of “innovation and interconnectivity,” making Maine a center for renewable energy production while investing in research and development, building the state’s technology sector. But at most joint campaign appearances with his opponents, Rowe has tried to set himself apart on the issues of leadership and ability to tackle tough issues through teamwork. And he often points to his seven years as Maine’s top attorney as proof. L. Sandy Maisel, a longtime professor of government at Colby College, said Rowe has a strong following in Augusta based on his years as attorney general and a state legislator. But because Maine is among the minority of states where attorneys general are elected by the Legislature, rather than by voters, Rowe’s time in that high-profile position may not provide as big a boost at the polls as in other places, Maisel said. “On the other hand, I think most people give him high marks for the way he ran the Attorney General’s Office, the things he did there and the way he staffed it,” Maisel said. Rowe’s path from the family livestock farm in a rural Oklahoma town of 400 people to Maine gubernatorial candidate began with a congressional nomination to West Point. After graduation, Rowe served as an infantry officer and later in a financial management unit at a base in Wiesbaden, Germany. He later met his wife — an Army captain from Maine named Amanda — at the base hospital in Fort Bragg, N.C. The couple married and eventually moved to Maine in 1981 after leaving the service. Rowe worked in financial management for a number of years before deciding to pursue his interest in law at the University of Maine School of Law. In 1992, Rowe won his first of four terms to the Maine House of Representatives, ending his legislative career as House speaker from 1999 to 2000. He was elected by the Legislature to the attorney general’s post a year later. During his tenure as attorney general, Rowe joined with other states in successfully challenging Bush administration policies that he contended failed to protect the environment. One prominent case forced the Environmental Protection Agency to regulate carbon dioxide emissions under the Clean Air Act. He also successfully argued the Maine Rx case before the U.S. Supreme Court. Fiercely opposed by the pharmaceutical industry, Maine Rx was a precedent-setting program that allowed the state to offer discounted prescription drugs to the poor and elderly. Rowe’s campaign relies more on his resume than his political charisma. With his shock of silver hair, muscular build and air of intensity, Rowe fits the mold of an ex-military officer. One occasional criticism is that he comes off during public appearances as overly serious, even dry. Running for office at a time when public persona and speech-making ability can be major factors in who wins at the ballot box, Rowe isn’t above poking fun at his own seriousness or speaking style. For instance, he got hearty laughs from the audience at recent forum in Bangor when he said — with an oversized, toothy grin pasted across his face — that his wife told him he needed to smile more on stage. Other voters are impressed by Rowe’s serious style and attentiveness. Anna Diebold of Phillips said she was already impressed by Rowe’s performance at a recent Farmington forum. But he won her over when he talked with her in detail afterward about her concerns about health care and education. “I really liked the way he listened,” said Diebold, who runs a local bakery. Rowe has also apparently been persuasive with campaign donors. His most recent campaign finance reports, filed last week, show that he has raised more than $400,000 and had $131,000 in the bank. Scarcelli, the other privately funded Democrat, had raised just shy of $300,000. “I’m known for getting things done,” he said. Education: Degree in engineering and mathematics from the U.S. Military Academy, master of business administration from University of Utah, University of Maine School of Law degree. Career: Served as active duty military officer six years, worked in the insurance and semiconductor industries for 16 years; served in Maine House of Representatives 1993-2000, final term as speaker. 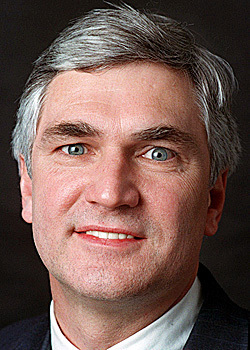 Maine attorney general 2001-2008. Family: Lives in Portland with his wife, Amanda. Father of four grown children, Angela, Chris, Robert and Lindsay.